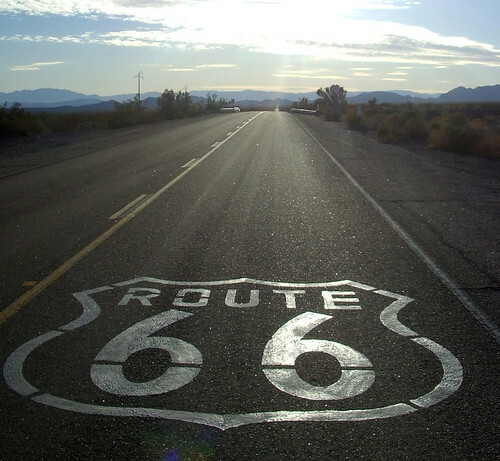 In a few years, you’ll be able to get your bike touring kicks on Route 66. The Adventure Cycling Association announced on Monday that it has chosen the corridor of that iconic American highway as its next long-distance bicycle touring route. Known as the Mother Road, “it winds from Chicago to LA, more than 2,000 miles all the way” …. OK, maybe you already know the lyrics of the song. The two-lane highway was established more than 80 years ago as one of the original U.S. highways. Decommissioned in the 1980s, it remains a part of our popular culture. Chalk that up to the road’s prominent role in John Steinbeck’s book “Grapes of Wrath,” or that classic by Bobby Troup, “(Get Your Kicks on) Route 66.” I think for me it was the 60’s-era TV series (below) that featured two young guys, Tod and Buz, seeking adventure as they tooled down the road in their Corvette. In any case, the route was an overwhelming favorite among Adventure Cycling members for a new long-distance bicycle route, says Carla Majernik, routes and mapping director. Long-distance cyclist Lon Haldeman, a legend in his own right, has led bicycle tours along the old route. Of course bicyclists already are drawn to Route 66. The Hostelling International Gateway Council presented a 350-mile bike tour along Route 66 from Miami, Okla., to Eureka, Missouri. The 2010 Bike MS Oklahoma rolled out from Tulsa to Oklahoma City along old Route 66. The bicycle route won’t be able to follow Route 66 mile for mile; much of it was torn up after decommisioning and other sections are now used by busy highways. Adventure Cycling says it will follow the corridor using roads appropriate for cyclists, and, when possible, sections of the old highway. In a departure from its other bicycle route maps that keep to small town America, Bicycle Route 66 will visit the hubs of Chicago and St. Louis, two cities that play a prominent role in the route history. Adventure Cycling says this marks the first time that one of its routes will combine with the goals of the U.S. Bicycle Route system — that is to connect both rural and urban areas. Ginny Sullivan, special projects director, says that’s similar to Route 66’s goal to connect the Main Streets of small towns and large cities. While the original Route 66 rolled out for 2,451 miles, it’s hard to know the distance of the future Bicycle Route 66. Work will start on the project this winter and is expected to take 3 or 4 years for completion, a typical length of time for a project of his magnitude. When Bicycle Route 66 is finished, I’m sure that travelers on Surlys, Treks and Cannondales will enjoy adventures to rival those that Tod and Buz had in their Corvette. See the Adventure Cycling Association press release.